 Experience one of Europe’s largest outdoor motorcycle shows. The BMF Peterborough Motorcycle Show in May at the Peterborough Arena is the season ‘opener’ and is one of (if not the) Europe’s largest outdoor motorcycle shows. The BMF Peterborough Motorcycle Show has been running for over 37 years and attracts vast numbers of visitors and exhibitors alike. After the successful introduction of new show elements in 2013, they are improving and enlarging them – The Classic & Vintage area will now have a Fire-it-Up zone so people can see and HEAR the machines from yesteryear including Dave Hailwoods display of his father’s bikes and cars. In the Adventuring and Overland Touring area, you’ll find more presenters and writers, a fantastic presentation stage and a number of exhibitors who are specialists in this field (see links to each area with further information on the left hand side navigation panel). The show is open from 14.00 on Friday 16th May for those who have purchased weekend camping tickets and for Day ticket holders the show opens at 09.00 – 17.00 on both Saturday 17th & Sunday 18th May. They are also introducing a brand new ticket in 2014 which will allow access on Saturday day AND includes entry to the evening entertainment on Saturday. (Note this does NOT allow access to camping and all ticket holders must leave the site by 01.30) This ticket does NOT allow entry on Sunday. In addition to the live evening entertainment there is a great main arena programme which always includes motorcycle related stunt shows and in 2014 they will host the ACU 1000cc sidecar championship as well as their own BMF Moped Mayhem. Exhibitors benefit from a choice of indoor or outdoor pitches and of course the event is well publicised throughout the motorcycle consumer and trade press, as well as local area advertising. And of course there are 100’s of exhibitors with all things motorcycle related from tires to clothing, boots to helmets and everything in between. 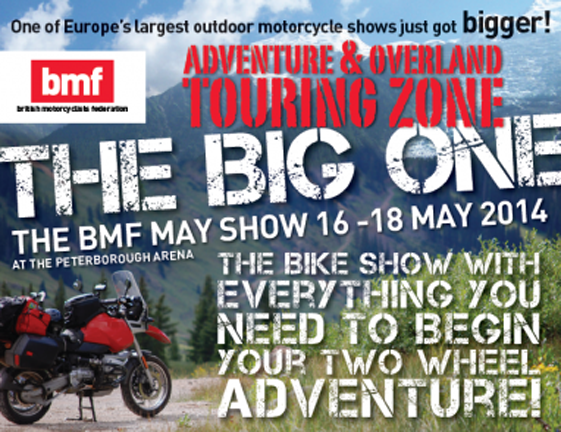 ADVENTURE AND OVERLAND TOURING AREA – BMF MAY SHOW 2014 – BIGGER AND BETTER!! The 2014 show season sees the return of the new and exciting Adventure and Overland Touring area which was first introduced in 2013. This addition to the show will host some fantastic features including: a large number of trade stands that have a direct relevance to Adventure Travel and Touring, Travel companies to offer escorted tours, trade exhibitors who can offer advice on luggage, insurance and all of the practical information you need ­­­to get you and your friends on the road (or off the road!) to start your own adventure! This area is inside one of the showground buildings so is not subject to the weather conditions and organisers hope that there will be static displays of both touring and off road motorcycles from the manufacturers. If that’s not enough, there’s more…………. The second section of this new area and based in the adjoining shed, The Presentation Zone, and it’s your chance to meet a number of writers, experienced travellers and adventurers and to see practical demonstrations ranging from how to pack your bike (and how NOT to), how you pick up a fallen bike (without destroying your back) and how to cope with mechanical failure and what to do in an emergency. This area is totally FREE to enter and will run throughout the weekend.